The St. James Court Art Show is partnering with the Jefferson County Public School system to bring artists to ten elementary schools on March 25, 2004. The ten elementary schools were selected on a first-come-first-served basis. Each school will host four artists who are active St. James Court Art Show participants, and will travel from within 100 miles of Louisville to participate in St. James Court Art Show Day. The artists will be demonstrating a work in progress from 10 am-2 pm. Classes of students from kindergarten to fifth grade will circulate through the demonstration area so all students will have the opportunity to see the artists at work. Artists will be given a copy of the JCPS core curriculum as a guideline so they can include in their demonstrations terminology and techniques with which the students are familiar. The goal is to expose students to different artistic mediums and to enable the art teachers to try these mediums in their classrooms. Some of the schools involved do not have full time art teachers; it is hoped that the St. James Court Art Show Day will provide inspiration for future development of arts programs in all public schools. The event has been scheduled for March to commemorate National Youth Arts Month. It is hoped the event will increase students’ appreciation of art and their awareness of the importance of art to quality of life. Events to celebrate the 100th anniversary of Old Louisville’s Central Park will begin in April and promise fun, excitement, and something for everyone. First Sunday Concerts, a tennis tournament,a champagne reception, picnics, an ice cream social, a brass band concert, a classic car show, a 5k road race, a fun dog show, a photography contest, historical exhibits, and a major Central Park Conservancy fundraiser are among the events being planned. Perennial events such as the Kentucky Shakespeare Festival, the Hidden Treasures Garden Tour, the Saint James Court Art Show, and the Holiday House Tour will also focus attention on the centennial. The National Trust for Historic Preservation, which is holding its national convention in Louisville the last week in September, will host a session on the historical plans and origins of Central Park in the Old Louisville Information Center during that week. A centennial poster, pins and t-shirts will be available as commemoratives of the celebration. Debbie Powers, chair of the Old Louisville Information Center Central Park Centennial Committee, invites all interested volunteers to attend the committee’s next meeting on Monday, March 15, at 6PM in the Old Louisville Information Center. Look for a detailed schedule of centennial events in the April Old Louisville Journal. Cynthia Knapek, Executive Director of Brightside, and other Louisville Metro officials will discuss litter at the first quarterly meeting of the Old Louisville Neighborhood Council on Thursday, March 18, 2004, at 7PM in the Old Louisville Information Center in Central Park. The Mayor’s Anti-Litter Project will be discussed. Everyone is invited to attend. 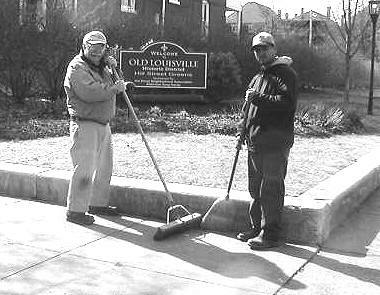 Spring is just around the corner: Herb Fink and Armando Melendez sweep up winter’s debris at the Hill Street Green at the corner of Third and Hill Streets. Everyone is invited to pitch in for the annual improvement and clean up session at Central Park on Saturday, April 10, 2004. I sell in all price ranges, and I respect an individual’s right to live where he/she feels at home. However, I must say I have been enriched by the diversity of my neighborhood (Old Louisville). It reminds me of a small town where those of means live near those who have less. Such a mixture encourages a sense of community. In my neighborhood, we have the Harvard and Yale educated, as well as those who have never finished high school. I know one woman who worked doubles on Christmas Eve and Christmas Day so she could pay for her grandchildren’s Christmas. I admire this woman’s guts and her perseverance. She works long hours in a modest position because she has had limited opportunities. No matter what the Jan. 17 letter writer and others may suggest, life is not a level playing field. Everyone doesn’t have the same options. I would never condescend to suggest this woman not be my neighbor. It seems to me that if we are to overcome the cycle of poverty, it must be through a sense of mutual respect for our shared humanity and not through social and financial segregation. America is about opportunity, yes, but it’s also about compassion and vision, which together can provide the very best for all her citizens, regardless of race, gender or income. A little more than a year ago, I bought a 3 unit house on South Brook. I occupy the first floor unit. Like many single family home owners, I have poured countless hours and resources into this beautiful old lady. I do my best to maintain the property inside and out. I shovel the street in front of the house (apparently the city doesn’t see a need to clean the streets in the winter) and pick up trash. In nice weather, I frequently pick up trash in front of 5 or 6 houses up the street. I’ve found that when I take the time to pick up trash for half the block, it stays pretty clean for a week or so. Oh, did I mention that several of the houses that I , the apartment-building owner , have picked up trash in front of are single family houses and not once have these single family owners reciprocated. I know who owns the houses on both sides of my building, both are apartment buildings. When I see something I don’t like, I talk to the owner and/or the residents and they actually take the appropriate action as a result of the conversation. and there it sets until it is scattered up and down the alley or until the quarterly Big Pick-up days. It would be really nice if there was a number that anyone could call for a special garbage pickup. I would be more than happy to pay a nominal fee to have the city come and pick up the big items behind my building instead of having to wait for the quarterly collection. I would also be happy to call and have the big items picked up that are left behind absentee owner buildings (but I wouldn’t pay). As for trash receptacles blocking the alley. Perhaps we could ask the garbage collectors to not leave them willy nilly all over and in the alley after they dump them. Do I think litter is a problem in Old Louisville? You bet I do. Do I think apartment buildings owners and apartment residents are THE problem. Not all apartment-house owners are terrible Old Louisville citizens and not all single family owners are Old Louisville paragons of virtue. If we all spent a little more time actually picking up the litter instead of blaming and trying to get someone else to pick it up, we’d have clean streets instantly. What are some things that could be done to improve the problem? Trash cans on the street (with regular and frequent collection)—If I see litter on the street, I will pick it up and carry it to the nearest trash can, but if there’s no trash can, and I’m not on my way home, I have to leave it on the ground. Perhaps others do the same. Ticket cars parked on the street on street cleaning day—Not ticketing them reinforces the fact that you can ignore the street cleaning signs and nothing happens. Talk your neighbors, including the dreaded apartment-building owner or management company, when you see a problem. Perhaps they are unaware of the problem. Special garbage collection phone number for big item collection. Ask the garbage collectors to not leave the trash bins in the middle of the alley. That’s generally not where they found them. Adopt-a-block—If we all took just a few minutes each week, we could make and keep Old Louisville clean and beautiful in less time than it has taken for me to write this letter. Louisville Neighborhood Council (OLNC) by April,2004. Up-dated membership lists are also requested. Individual memberships in the OLNC are renewable at $5. Rose Grenough Nett recently took a trip to the Philippine Islands to visit her eldest sister, Mary. Mary, a graduate of Spalding University, is a nurse who has been serving with the Maryknoll Sisters in the Islands since late 1963. Rose had been considering a visit to her sister’s part of the planet since finishing Peace Corps service in Colombia in 1967, and the opportunity finally arrived. ”Having the opportunity to spend almost three weeks in February in what has become my sister’s home was a wonderful experience,” said Rose. health care to folks who don’t generally have access to hospitals or emergency care centers. Rose has many fond memories and a few souvenirs of the trip, which was made with another sister, Millie, also a Spalding graduate, who lives in New Haven, Connecticut. Among the souvenirs is a handmade ”mandolino” that Rose is determined to play one of these days. (Any teachers out there? One possible glitch: this Philippine instrument has twelve strings!) She will long remember the warm, gracious hospitality and beautiful smiles of hosts and hostesses along the way. And she gained a much greater appreciation for sugar and rice, after observing the amount of human labor required to plant, nurture, cultivate, and refine these products. Rose and her husband, Fred, have lived in Old Louisville for over thirty years and are active members of the Garvin Gate Association and the Old Louisville Neighborhood Council. Rose represents Old Louisville in the Louisville Coalition of Neighborhoods and the Airport Neighbors’ Alliance. Fred is a member of the Old Louisville Neighborhood Council Zoning and Land Use and Property Improvements Committees. Greetings from the Old Louisville Coffeehouse! It has been six months since we opened the doors and we feel like we have been apart of this neighborhood for years. It has been a wonderful experience meeting all of our neighbors and we could not be happier to live and work in Old Louisville. Winter has been a bit slow, but as soon as the weather warmed everyone was out and about again. We have added some new items to our menu; we now deliver, and we extended our hours on Sunday to 7:00pm. We hope to fill our Fridays and Saturdays with music and special events. We still have fabulous local artwork and jewelry and hope to find even more interesting artwork to share. Our art on the walls changes about every six weeks; check in regularly to see what is new. We have a knitting group that meets on Sunday afternoons; all ages and abilities are welcome. We have a chess group that meets on Tuesdays at 8:00pm and is open to all ages and abilities. If you want to buy whole beans or ground coffee to go, come by Thursday for a 10% discount on a pound or more. Thanks again for the support and we hope to be able to offer great Intelligencia coffee, fabulous pasties desserts, great lunch items, art, music and more for years to come! Proposals to operate valet parking during the St. James Court Art Show are being accepted until April 16, 2004. For more information, call 635-1842 or e-mail scoleman@stjamescourtartshow.com. Well, maybe not Dinah, but with Chefs Michele and Bob Brinke of the soon-to-be-opened Chef’s Table and Old Louisville Winery at First and Oak Streets. Although the restaurant is not scheduled to open until early April, cooking classes offered through the Delphi Center for Teaching and Learning at the University of Louisville will begin on March 8, 2004. Beginning Culinary Skills, the first class, will meet on Mondays, March 8 through April 12 from 7-9PM. Students will learn about bread-making, homemade pasta, pastries, and fundamental cooking techniques. Intermediate Culinary Skills begins on Mondays, April 19 through May 17 and will feature cooking with wines and spirits, fondue, and intuitive cooking, among other topics. Participants will end each class by consuming the dinner prepared that evening. Pamphlets will more information, including registration procedures and fees are available at the Old Louisville Information Center. Spring is on the mind of everyone as we flip the page on the calendar to March. It’s printed right there on most of our calendars... SPRING. It may not come as quickly as we all hope. It may also simply tease us. . .warm one day...cold the next. With the coming of spring, everything changes. The colors return to the gardens t he clothes we have been layering can be less layered , and even our choices of food changes with the season. As we turn our faces to the sun and hope for warmth, sometimes we need to also resign ourselves to the fact that despite new diets, old-fashioned comfort food needs to win out occasionally. My grandmother would only make these dishes in March. She was a wonderful little lady, but eccentric to the most extreme degree. Both dishes have ties to St. Patrick’s Day but I think she really made them for the my grandfather’s birthday in early March. I hope you enjoy these March family traditions. Rinse and drain the raisins and set aside. Lightly coat them with an extra tablespoon of flour, if desired. Sift together flour, baking powder, soda and salt; cut in butter with a pastry blender until mix resembles coarse corn meal. Add raisins to the dry mixture. Beat egg slightly and add to milk. Make a “well” in the center of the flour mixture and add the liquids all at once. Stir with fork until mixed together. Do not overmix! Turn into a greased 8" round baking pan (a small iron skillet works well, too) and bake at 350 degrees for 25 - 30 minutes. Makes 8 large wedges. Quickly sear the lamb cubes in a hot skillet until just browned on all sides. Place all ingredients in a large Dutch oven. Cover and cook over low heat 1 1/2 hours or until meat is tender. Crane House will host the fourth annual Asian Art and Antiques Market on Saturday, March 13, 2003, 10:00 am - 5:00 pm and Sunday, March 14, 2003, 12:00 - 5: 00 pm. The Market will feature the largest number of booths with specialty Asian items ever assembled in one Louisville venue. The area’s top dealers of Asian antiques, as well as retailers of Asian art, will participate. Exhibitors and artists will display and sell unique and one-of-a-kind objects such as paintings, furniture, vases, urns, jewelry, and unusual pieces both antique and new, from many countries in Asia. The Market, which is free and open to the public, will be at Crane House, 1244 South Third Street, Louisville. The Preview Party, a Crane House fundraiser, will be Friday, March 12, from 5:00 - 8:00 pm. Proceeds benefit Crane House’s educational and cultural programs. All art and antiques will be available for sale during the Preview Party. Tickets are $25 per person, by reservation only. The deadline for reservations is Wednesday, March 10. Reservations may be made by calling 635-2240, or e-mailing adm@cranehouse.org. The Filson Historical Society will dedicate an evening to blues music and to Louisville’s blues heritage on Friday, February 20, at 7:30 p.m. at the society’s headquarters, 1310 S. Third Street. The event will consist of a concert of blues music performed by the 10th Street Blues Band; a short presentation about the history of blues music in Louisville; an exhibit of blues artifacts, instruments, records and photographs of blues performers; an open bar of beer, wine and soft drinks; and light refreshments. Admission is $25.00. The discounted cost for Filson members is $18. Reservations are required. Call The Filson at (502) 635-5083 for reservations and more information. The blues is a key part of African-American culture, and Louisville’s blues roots date back to the beginning of the 20th century. Several legendary blues artists called the River City their home, including Sylvester Weaver - the Smoketown resident who recorded the first blues guitar record in 1923 - Bill Gaither and blues queens Sarah Martin, Helen Humes and Edmonia Henderson. A blues singer and guitar player, Gaither received the Combat Infantryman’s Badge for his service during World War II in the Army’s earliest black combat unit in the Pacific theater. The 10th Street Blues Band has performed at the Kentucky Folk Life Festival in Frankfort and in blues clubs and festivals around the state. The Filson Historical Society is Kentucky’s oldest and largest independent historical society. Organized May 15, 1884, its mission is to collect, preserve and publish historical material, especially pertaining to Kentucky, the Ohio Valley, and the upper South. The Filson is headquartered in the Ferguson Mansion in Old Louisville and houses a library, a museum, and a special collections department. 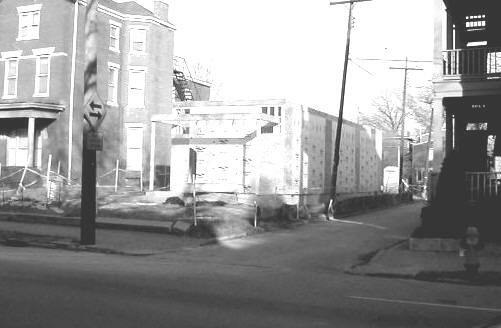 A new house is going up at 1239 South Second Street on a vacant lot. Developer Steve McCubbin reported at the February Property Improvement Committee (PIC) meeting that the two-story structure has been given Landmark’s approval and will be sold as two (1268 and 1283 square feet) condominiums with three bedrooms and two baths apiece. A carriage house to be constructed at the rear of the property will contain an additional apartment. The house will have an all brick and masonry exterior. 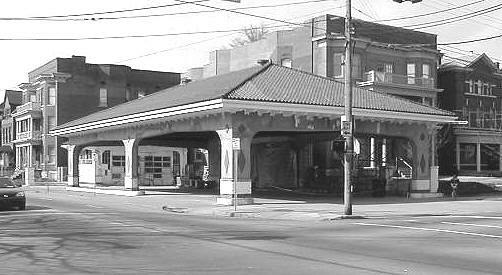 Gary Kleier announced at the PIC meeting that the old Sunoco Service Station at Third and Hill Streets will soon be reincarnated as a green market. A vendor from the demolished downtown Haymarket will reportedly sign on to sell produce at the site. Glass garage doors will be installed to enable year-round operation. The freestanding garage on the west side of the property may eventually be used as a meat market. Jean Crowe reported that the structure originally housed the Diamond Gas Station. Gary Kleier agreed, noting the diamond reliefs on the structure’s columns and diamond shapes in the floor tiles.